Carrie Fisher died today. I found out as I drove around town running errands. She was the actor who played Princess Leia in the original three Star Wars movies, as well as last year’s Episode 7, The Force Awakens. I’m not a rabid Star Wars fan, but the movies have had an impact throughout my life. Particularly the first one, the original Star Wars. Younger people refer to it as Episode 4 or A New Hope. To me, it’s Star Wars — the original. I was thirteen in 1977 when it came out. I watched it 9 times in the theater. Remember, there was no Netflix, Blu-Ray, DVD or even VHS video tape. If you wanted to watch the movie, you needed to go to the theater. My local neighborhood movie theater had only a single screen and they played Star Wars for a whole year. That’s how big the movie was. For me, no movie will ever have an impact as large as Star Wars. The utterly original movie, with its breakthrough special effects, for an impressionable thirteen year old, was a perfect combination. Old enough to understand but not too old to be jaded. And I think a thirteen year old in 1977 was a lot more naïve than a thirteen year old now. I see it in my younger son. Surrounded by electronic gadgetry, computer generated movies and video games, it takes so much more to impress today’s teens. 1977 was still analog — on the cusp of the coming digital age. The impact of Star Wars is shared by others my age. At work we often classify people as before and after Star Wars. That is, people born before or after Star Wars (1977). I watched Rouge One yesterday, finally seeing it after my Florida trip. It was a solid movie, but lacked the nostalgia and the characters of the original. Enjoyable but ultimately forgettable. I remember the original Star Wars 40 years later, more vividly than Rouge One which I watched 24 hours ago. 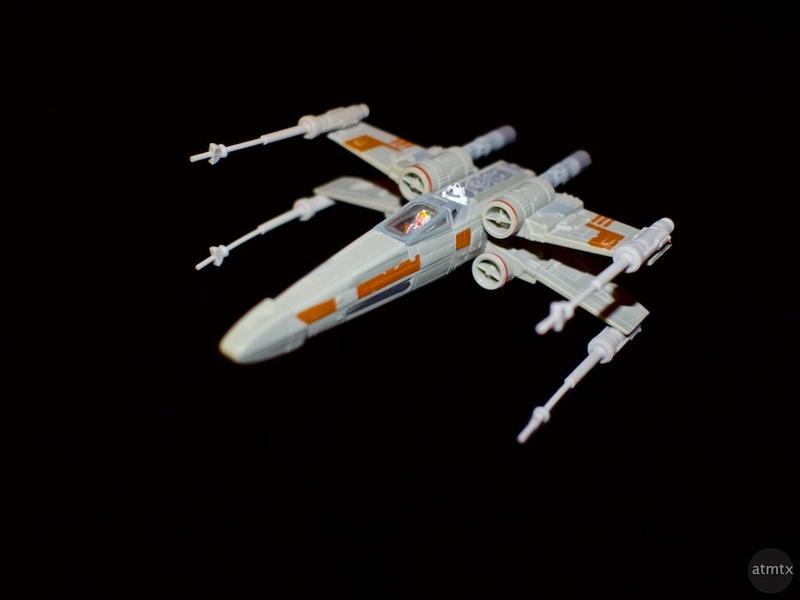 The only Star Wars paraphernalia I own is of this modest model of the X-Wing Fighter. I sits on the credenza behind my desk as a proxy to my past, among other notable items from vacations as well as photos of my family. I remember going to the theatre at Robinson Barracks Stuttgart Germany to watch Star Wars. The whole audience ooood and auuuud at the beginning, we thought it was so amazing the way the words were going away from us. First time ever, it caught your attention, them the story begins and 40 years later, we’re still watching. Carrie Fisher will be missed. Rest In Peace. The intro was very memorable. I especially liked how the Star Wars logo appeared just as John William’s score started. So dramatic. No opening credits to wait through, which seemed so different from the movies of the day. This was the only Star Wars movie I really loved. I feel so sad about Carrie. She was too young. Much too young. I vividly remember seeing the original Stars Wars. I was in 5th grade and I can recall sitting in the theater and seeing those Star Destroyers roaring across the screen in the opening sequence. I was amazed. The special effects were ground breaking and still hold up today against movies that are mostly created with computers. Ah, Carrie. What boy didn’t have a crush on Princess Leia?